LIVE AUDIO VIA WI-FI See and hear the thrill of your team’s game-winning touchdown… The brilliance of a classic guitar riff… The wisdom in a professor’s words. The Hearing HotSpot™ is an innovative, new listening technology that allows any venue to stream audio via Wi-Fi from TVs, music sources or live programs directly to an individual’s smartphone or tablet. 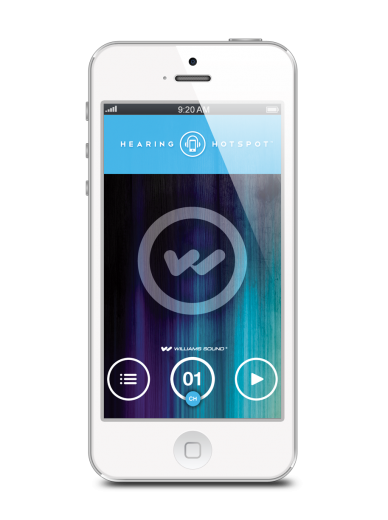 To listen, an individual simply connects to the local Wi-Fi, downloads the free Hearing Hotspot™ app from the Google Play or Apple App Store, and selects the audio channel they want to hear. Each Hearing HotSpot™ system is customized, consisting of hardware components and a proprietary software license. Once a system is installed in a venue, the software license is activated by Williams Sound based on the number of channels (up to 56) at that venue. Williams Sound remotely monitors the status of each system and can deliver system upgrades directly to the venue without going on-site. • Hardware • Software & Software License (based on # channels) • Monthly subscription fee Note: iPhone pictured is not included. Each Hearing HotSpot system is custom-built and configured at Williams Sound. Call yourWilliams Sound representative to get more information on how to order your system.